Once Deadpool made (and continues to make) boatloads of money, people were curious what that would mean for other comic book properties. If an R-rated, hyperviolent, profanity-laced film can do so well, then perhaps other films featuring caped crusaders would bring in great box office numbers as well. Guardians Of The Galaxy writer/director James Gunn worried that people would misconstrue Deadpool’s success, and think that its performance was due to its hard-R rating and not because it was an original approach to the superhero tropes. 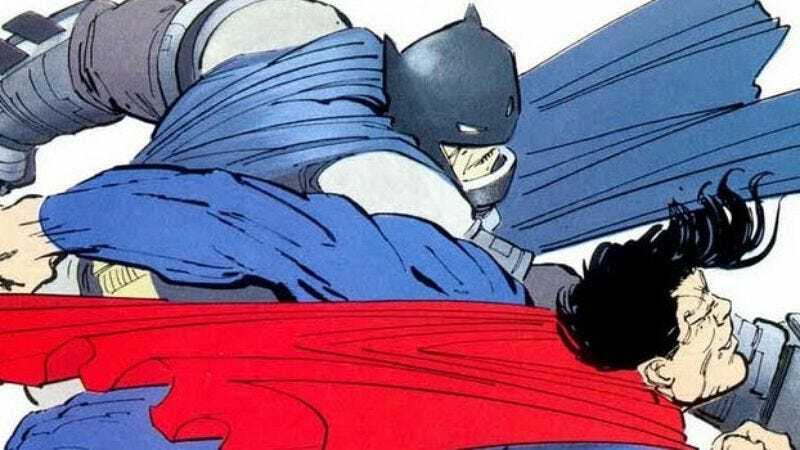 And it wasn’t long after that it was announced there would be an R-rated “Director’s Cut” of Batman V Superman: Dawn Of Justice, suggesting that there was more darkness and violence (and possible cuss words) in the story about two characters ostensibly aimed at children. There is certainly plenty of precedent when it comes to superhero stories that are, for lack of a better term, R-rated. Marvel had an entire line, Max, devoted to the concept. Some R-rated superhero stories have been good, but only a few have been great, and they all share one quality: they’re deconstructions. Faraci looks at three major comic book works that transformed the superhero genre by taking an “adult” approach: Alan Moore’s Miracleman (Marvelman to some), Alan Moore’s Watchmen, and Frank Miller’s The Dark Knight Returns. By going into great detail of what each means, the eras in which they were created, Faraci is able to demonstrate that each was built on what came before: Moore’s work was a grounding of superheroics, but only out of a firm understanding of what they meant to people and a certain love for their simplistic charms; Miller chose to refute the Adam West Batman by plunging the DC universe into the modern day America where superheroes would become political pawns and/or fascistic icons. All three were developed with great thought and reverence to what preceded it and were used to examine a layered approach to the mentalities of the caped community. It’s an excellent read that acts as a great primer on this discussion of adult-oriented comic book fare in light of the latest news. Will this R-rated superhero film typhoon that is surely ready to hit be filled with interesting attempts at re-examining tropes with an eye to the psychological, or is this simply wresting what should be childhood characters away from children who idolize them in the hopes of a big cash-in? Only time will tell.